"About 65 paces exactly north of Rosmodreuy Circle is a flat stone 6 inches thick at a medium, 2 foot 6 inches wide and 5 foot high; 15 inches below the top it has a hole 6 inches diameter, quite through….In the adjoining hedge I perceived another, holed in the same manner," so wrote William Borlase in 17541. The holed stone, as can be seen in the following image, is now used as a gatepost, and was so used when described by the inspirational J T Blight in 18652. 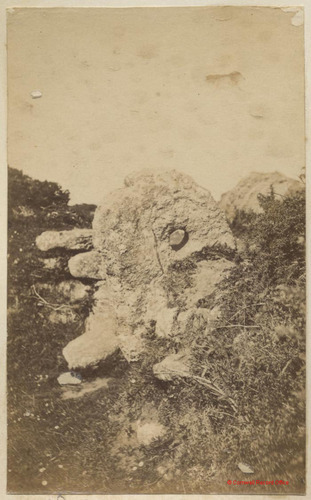 This photograph must have been taken at roughly the same period as Blight was writing, and from this angle it is difficult to determine whether or not the stone was in use as a gatepost at the time of the images creation. When compared to the following image the layers of stones behind it do bear some resemblance to those on the opposite side of the gateway. Image courtesy of and © Cornwall Record Office. 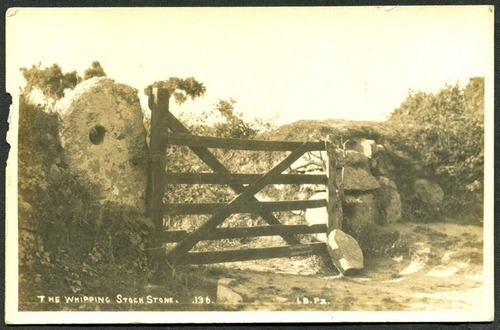 This real photographic postcard also shows the holed stone to the north of the Merry Maidens, but the stone is here named as "The Whipping Stock Stone", and this is a name which I had not encountered before obtaining the card, although I will certainly be on the lookout for further references. The publisher is given as LB, PZ, which undoubtedly refers to Lethby's Bazaar at Penzance. The card is also unusual in that it shows the stone at a 90 degree angle to its present position, and from that shown in the previous photograph. 1. Borlase, William. 1754. Observations on the Antiquities, Historical and Monumental, of the County of Cornwall. Printed by W Jackson. 2. Blight, J T. 1865. Churches of West Cornwall; with some Notes of Antiquities of the District. Parker & Co (2nd Edition, 1885).